Google Maps added the map view available at Google Experimental Search. Google extracts the most important locations from web pages and lets you see the search results on a map. To restrict your search to web pages, you need to click on "Show search options" and select "Mapped web pages" from the new drop-down. 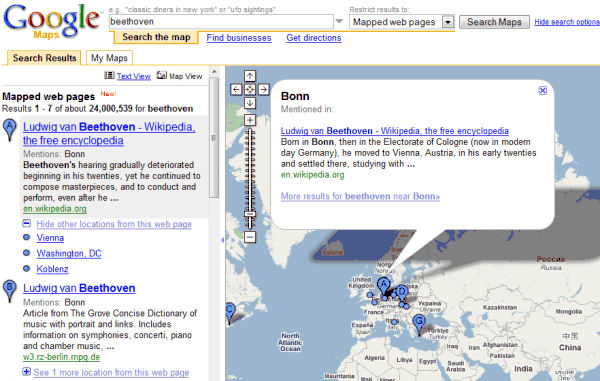 Google displays the most relevant web pages that include locations from your current map view, but you can change the location in your query using the operators near or in: for example, [Beethoven near Germany] or [Beethoven in Europe]. This is an entire new way to search the web by changing the focus from general information to geographical information. You could use it to search for people, companies, organizations, events, traditional food or anything that could be connected to a location. Web pages include a lot of useful information that isn't properly used by search engines: addresses, phone numbers, dates, opinions, characteristics, quotes, examples. All of these could be used to create connections between people and some important dates, between products and people's opinion about them, between concepts and examples. Web search engines could answer to complex queries like "the general opinion about iPhone in the first week after its launch" by using the information available on the web and cleverly extracting attributes and connections. Google Maps added the map view available at Google Experimental Search. No, in fact the "map search" is available in Google Experimental since day 1. But adding "mapped web pages" in Google Maps is new. Yes, I know and I didn't say something else. Thanks, I never even saw that box. Problem is, I'm routinely 1st or 2nd for a specific geo location which my domain is named after - with no SEO payments :-) - but when looking through 5 pages (I think 50 results), it was no where to be found! So many projects, no customer service! ARGH! I'm trying to figure out an actual useful application of this new search type. Does anyone have examples that work well? If they added time arrows as described here http://blogoscoped.com/archive/2007-05-24-n40.html this could be more useful, showing the movement of a person throughout their life. As a local service provider with a website, how the heck do I get my homepage associated with an address. I have an account on google local business with my companies address but that is not helping me to show up in these results. thanks for any clues! * by showing ‘smart’ snippets that summarize the metadata inside the page and allow to take action without actually visiting the page. * by showing map and timeline views that aggregate metadata from various pages. * by showing pages related to the current result"